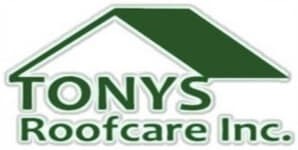 Tony's Roofcare Inc. has built a reputation for dependability, professionalism and estimating precision helping area residents install and repair their roofs since 1997. We use only the highest quality roofing supplies and products on the market, and offer free estimates for all prospective clients. Whether you need a new roof, repairs or custom roofing, we offer a service to meet your needs. Whether you are putting on a new type of roof, doing a roof replacement of an old roof, or need a roof repair, you want a licensed, bonded, insured professional roofing contractor. Tony's Roofcare Inc. also provides gutters to finish your roofing project or to replace old, damaged or leaky gutters. Gutters and eaves are custom designed on location to eliminate leaky joints and to ensure a perfect fit. Properly fitted and installed gutters can help protect your home from erosion and damaged caused by runoff water, and can eliminate expensive future repairs. Tony's Roofcare Inc. is now a GAF Master Elite roofing installer. There are less ten in the area that have achieved this status due to stringent guidelines that GAF uses in order to qualify for this level of professionalism. Others will give preferred status to anyone who will pay for it – examples are Angies List and other roofing certified programs like Certainteed, Pabco, IKO, and Owens Corning. We use to belong to these programs. When you need roofing or gutter services, look no further than Tony's Roofcare Inc. We are waiting for your business! To request a free quote, please use our feedback form or contact us by telephone.